The Pacific Islands are a region where societies are closely linked to the coral reef ecosystems surrounding them. At the same time, the region’s reefs are strongly threatened by global environmental and socio-economic changes. The close social-ecological connectedness in the area potentially reinforces these threats and results in a situation where environmental change can have particularly severe consequences for local societies. Yet, research into the resilience of these linked social-ecological reef systems in the face of global changes is in its infancy. REPICORE combines social and natural sciences for an integrated assessment to achieve a more holistic understanding of coupled social-ecological systems. 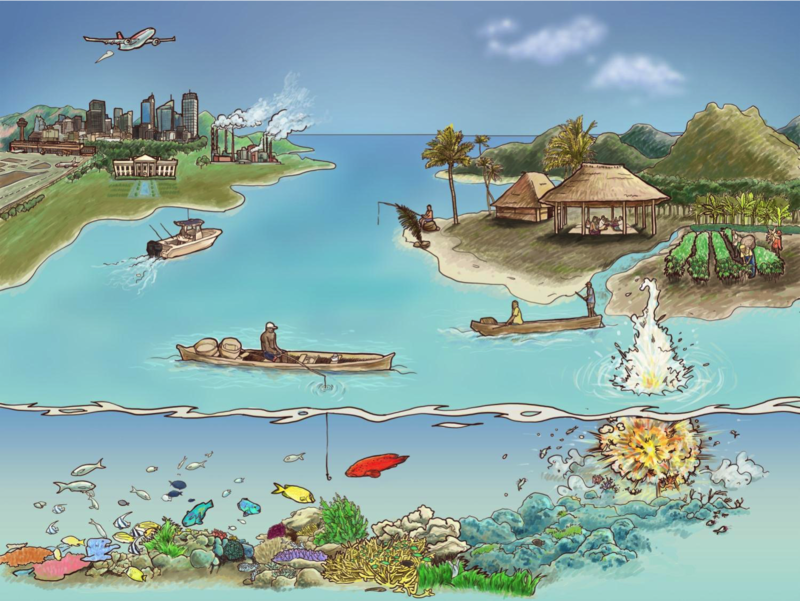 Marine resource use and coastal livelihoods are examined across three Melanesian countries in conjunction with field assessments of reef fish and benthic communities. This is combined with meta-analyses of reef fish community and associated socio-economic data. The overall aim is an improved understanding of social-ecological feedbacks that erode or strengthen resilience. The project aims to provide important and much-needed information to develop strategies to strengthen the resilience and sustainable use of Pacific Island coral reef systems. It brings together leading international experts on social-ecological resilience assessment, and links up with institutions in the Pacific Islands. While this region and its societies are likely to bear the brunt of global change, it still does not receive the necessary scientific attention to adequately understand and address the social-ecological consequences of global change. REPICORE constitutes a timely and response-oriented research project to advance the understanding of one of the most urgent, but least understood issues related to global change. It is funded by the German Ministry for Research and Education (BMBF) in the frame of the “Research for Sustainable Development Framework Program” (FONA), and forms part of the ICSU and UNESCO-sponsored “Programme on Ecosystem Change and Society” (PECS).